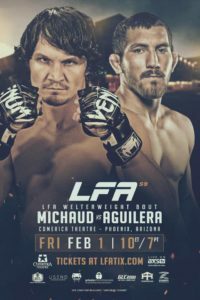 The Comerica Theatre in Phoenix, Arizona, hosts LFA 59. The main event is a Welterweight contest between knock out artists Christian “The Beast” Aguilera & David “Bulldawg” Michaud. Aguilera has won 3 of his last 4 fights all by knock out. “The Beast” went 3-1 in 2018 and heads into his 4th fight with LFA. Michaud has fought for the UFC, Victory FC, RFA, Combate Americas, Bellator MMA, and is 1-1 in LFA. The “Bulldawg” is on a 3-fight win streak, with all the wins coming by stoppage.